Affordable, entry-level laser tag toys, are they worth your money or should you go for a more expensive, better quality home laser tag set? Laser tag is one of the best real-life action games you can play. It’s fun, social, exciting and it also requires a bit of strategic sense. Home laser tag has been on the rise in the last decade with several greats laser tag sets that offer great value. You could spend as much as 300 dollars for a very decent laser tag set and have lots of fun with it. But you can also choose from lower-end, entry-level laser tag toys that sell for around 10-30 dollars. Obviously for that money you can’t expect the same quality and features as with a higher end home laser tag set, but that doesn’t mean these cheap laser tag toys aren’t worth it. >> Check out our list of Best laser tag guns. Let’s have a look at some of these cheaper, entry-level laser tag toys. Are they any good and should you consider buying them, or is it better to invest in a more sophisticated laser tag set? Our favorite laser tag toys in this list are the Discovery Kids Spaceship laser tag guns. They were the first palm-held controllers to enter the market. All you need to do is slide one of the two controllers on to your hand and start shooting. This set of 2 laser tag toys (one orange and one green) is a great entry level laser tag set for children aged 6 years and up. That’s manufacturer’s recommended age, but we think 4 or 5 year olds can also have lots of fun with this set. The controllers are comfortable in the hand, not heavy at all, and they feel reasonably robust. The two guns look and sound like spaceships which will appeal even more to smaller children. Don’t expect any special features though, it really is just a matter of shooting your opponent. The grips of the guns will fit both small and big hands, so parents can play along. The sound effects can perhaps get to your nerves after a while, but kids will love it. What’s good is that if you get more than one set, all controllers will work together. So if you have more than two kids ready to play laser tag, you can easily buy two sets. Is this set worth your money? Yes absolutely, as long as you know that these laser tag toys are for younger kids. They are very simple toys, no fancy features, just plain and simple fun. >> Read our review of the Discovery Kids Spaceship Laser Tag Set. As you can tell from the image, this set of two laser tag toys are pretty much the same as the Discovery Kids set, they just have a different look and feel. It comes down to personal preference which set you would like the most. The guns actually produce real-life infrared beams and the sound and vibration effects are pretty cool too, especially for kids. You can actually tag each other and score points so it does feel like you’re playing a real laser tag battle. The palm-held units both have a transmitter and a receiver and they vibrate when hit. Yes it is, they are fun laser tag toys. Young kids, ages 4 to 8, will enjoy these toys. The controllers are fairly robust and at a very affordable price, this set can be a great introduction to the awesome world of laser tag. This is the second set of laser tag toys offered by Discovery Kids. They are very similar to the palm-held controllers in regards to functionality and features, but the guns in this Galaxy Blaster set are in the shape of actual laser tag guns. The set comes with two blasters, one in green and the other one in blue. They are incredibly easy to handle and sit comfortably in the hand. They don’t actually shoot real laser beams, just LED light rays, which is much safer obviously. The manufacturer’s recommended age is 6 years and over, but we would recommend four years and over. Please note though that kids over 8 years old will easily get bored with these laser tag toys. Yes it is, although we prefer the palm-held laser tag toys at number one. 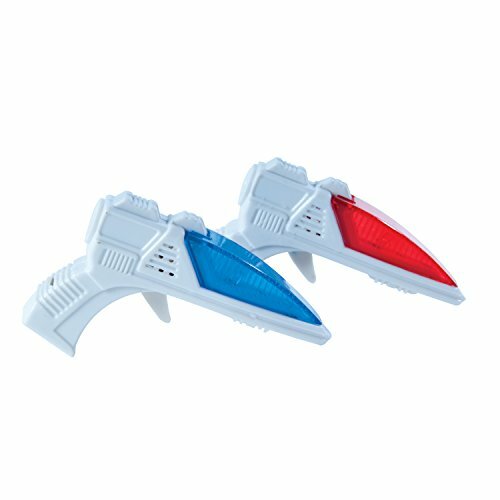 If you’re looking for gun-shaped laser tag guns, it’s better to go for a higher quality laser tag set with more features. 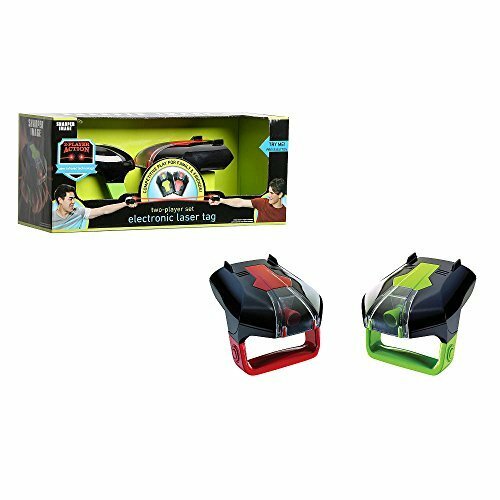 Proudly promoted and packaged as the world’s smallest laser tag toys, this set of two miniature toy guns will definitely not hurt your wallet. So how small are they? With 2 x 3.8 x 0.8 inches, they are very small indeed! They have 8 different sound effects, so each time you shoot you’ll hear something different. They also light up in blue and red depending on which gun you have. You can’t actually tag anyone, it’s really just a matter of randomly shooting. No, not really. It’s by far the cheapest in the list and you get what you pay for. If you’re bored, they can bring in a bit of fun, but otherwise these laser tag toys won’t get you very excited. It could perhaps be fun in the office, on a Friday afternoon. Laser tag toys in the cheaper price range are worth it if you know what you’re buying and know who you’re buying them for. Would I go and play a laser tag battle with these toys? No, not really. But they are great for younger kids who have never played laser tag before. Let them play with it for a while, and if they go crazy about laser tag, then there’s always the option to upgrade to a more sophisticated laser tag set when they’re ready for it. Another reason to go for a cheaper laser tag set is that they are very easy to handle. They typically lack complicated features so young kids can play with them without any hassle. There is literally no learning curve whatsoever. If you’re contemplating between a higher end laser tag set or one of these cheaper laser tag toys as a long-term investment for your kids to play with, it’s probably best to go for a higher quality set straight away. The more sophisticated laser tag toys don’t cost a fortune anymore, so it’s not a huge financial risk.